✓ We Design ✓ We Fabricate ✓ We Install Our clients come to us with plans to build or remodel and the desire to create the best space their budget will allow. Normally it’s a kitchen or bath, but sometimes a home office, mud room, or other space where they’d like to install cabinetry, stone, or appliances. Every space we create is different — a reflection of its owner, their lifestyle, and their taste. We offer: ★ Kitchens designed around chefs, party hosts & busy families, in styles ranging from traditional to transitional, cottage to modern ★ Baths built for primping, indulgence, & organized storage ★ Custom-fabricated countertops & sinks in granite, quartz, marble, Vetrostone & more ★ The expertise of our highly credentialed, creative, stylish design team ★ Professional, on-time project completion backed by decades of experience When you come to Maine Coast Kitchen Design, you can expect that we’ll: ✓ Listen carefully to your ideas and match them with the perfect products ✓ Suggest creative touches, money-saving approaches, or wow-factor products to complete your design ✓ Plan and price out all the details with your budget in mind ✓ Source and fabricate the perfect stone countertops ✓ Install with care, efficiency, and a scrupulous eye for detail ✓ Manage your project to ensure that every step is an enjoyable one ✓ Tie the bow on a space we hope will become the crown jewel of your home About Me: Growing up in a large family where the kitchen was “party central,” with a mom who enjoyed being the head chef, many of my favorite memories have my childhood kitchen as their backdrop. Having married my very own household chef, and now with kids of our own underfoot, the kitchen is once again the hub of my family’s busy life. 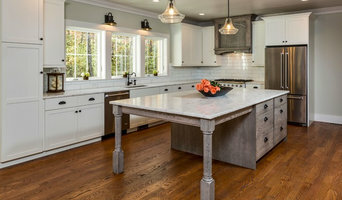 These special spaces, and the numerous others I’ve helped clients with over the years, all fuel my passion to help others create their very own “heart of the home.” I make it a priority to put all of my efforts into completing the kitchen of your dreams and providing you the best experience, all while creating a lasting friendship. If I’ve done my job right, your design process will be the first of many great memories centered in your brand new kitchen. Featured in Houzz editorial "The Return of the High-Back Farmhouse Sink". *Authorized Mid Continent Cabinetry Dealer* Welcome to Designs Kitchen and Bath Center, your hometown alternative. We are a locally owned and operated complete kitchen and bath design center, located in Windham, Maine. We work hard to make your dreams become reality. Our mission is to provide the highest quality of customer service and products at a reasonable price. Whatever your kitchen or bath requirements, we have the design solutions for your needs. Tavia is the in-house designer for M.R. Brewer, a custom cabinet and mill-work shop located in Portland, Maine. Tavia graduated with a Bachelor of Science in Interior Design and went directly into kitchen design after finishing school. She has worked for the last 12 years specializing in custom kitchen and bath spaces. Full service kitchen and bathroom design services. Space planning, 3D color renderings, and floor plans. Interior Design services available upon request. A Complete Remodeling Company... In the home improvement business for over 25 years, Maine Properties professionals coordinate your remodeling needs from concept to completion and eliminate your cares and concerns. Our main focus is on customer service and we strive to treat each job as though it were going into our own home. The Cabinetworks is a designer owned kitchen and bath design and cabinetry showroom located in Windy Knoll Village, 62 Portsmouth Ave. Stratham NH 03885. Specializing in design, Anita Colby (a certified master kitchen and bath designer) listens to her clients needs and wants, and can transform an ordinary space into an extraordinary one with ease. Licensed Maine architect and project manager with 42 years experience in residential architecture and specializing in waterfront houses. Expertise and individual attention when your project has to be on time and on budget. Project representation and management for owners who are away from Maine during construction. What does a Portland kitchen designer or bathroom designer do? 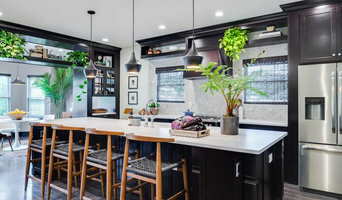 A kitchen and bath design professional in Portland, ME knows to take all of these crucial points into consideration and can help plan the layout, materials and overall look and feel of either of these rooms in your home. Kitchen designers, as well as bathroom designers, are constantly staying on top of trends in the ever-changing industry. The designer also knows the best layout for your room, and can configure the layout for optimal functionality and utilization of the space. In the kitchen the refrigerator, stove and sink should be laid out in relation to one another, and it should be seamless and easy to move from one to the other. A Portland kitchen and bath designer will know how to work with a contractor and architect to plan the flow of the room to work best for your needs. Here are some related professionals and vendors to complement the work of kitchen & bath designers: Kitchen & Bath Fixtures, Appliances, Tile, Stone & Countertops, Cabinets & Cabinetry, Woodworkers & Carpenters. Before you talk to bath and kitchen designers in Portland, ME, consider how you will use the room. For your bathroom, is it necessary to have a bathtub for bathing kids or pets, or would a shower suffice? Perhaps all you need is a half bath for downstairs or a smaller guest bath for occasional use. Similarly, for kitchen renovations consider your cooking habits. Do you eat out every night but need a space to entertain in? If so, a smaller kitchen might be fine for you, with a space devoted to wine storage or a bar, whereas others might prefer a bigger stove or extra cabinets. When interviewing Portland kitchen and bath designers, make sure to share these habits so they can best fit the room to suit your needs. Find a Portland kitchen designer or bathroom designer on Houzz. Narrow your search in the Professionals section of the website to Portland, ME kitchen and bath designers. You can also look through photos in Portland, ME to find a kitchen or bathroom you like, then contact the professional who designed it.